On Thursday, the Town of Benson will officially kickoff an effort to restore the tennis courts located at the Benson Civic Center. The courts at 1204 North Johnson Street have seen better days. 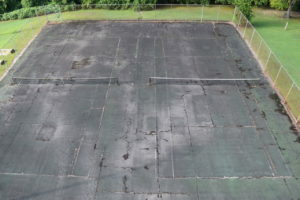 Once a bright green rectangle with fresh white netting, the courts today are unusable. The surface is warped and cracked and the hardware is rusty — a tennis match hasn’t been played at the Civic Center in quite some time. 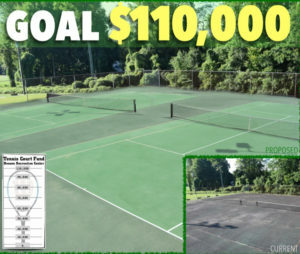 Following a conversation earlier this year about what to do with the area, a group of former South Johnston High tennis players, dubbing themselves the Capital Campaign, approached the Town of Benson with one goal in mind — to restore Benson’s tennis courts back to their former glory. Reggie Holley, William Auman, and Tommy Johnson will serve as chairs of the Capital Campaign. They will be joined by Town of Benson administration on Thursday at 11am to officially announce a public-private partnership aimed at overhauling the dilapidated tennis courts. “Our aspiration is to restore our tennis courts to assure that they are an asset for Benson and for all who are proud to call Benson home,” explained Mr. Holley. The campaign will be a fundraising effort between Mr. Holley’s group, the Town of Benson, and Benson Parks & Recreation. With a target amount of $110,000, the funds will be used for the complete removal of the old courts and the installation of new asphalt, new nets and hardware, new fencing, and updated LED lighting. The public is invited to the Fundraiser Announcement on Thursday at 11:00am at the Benson Tennis Courts at 1204 N. Johnson Street.